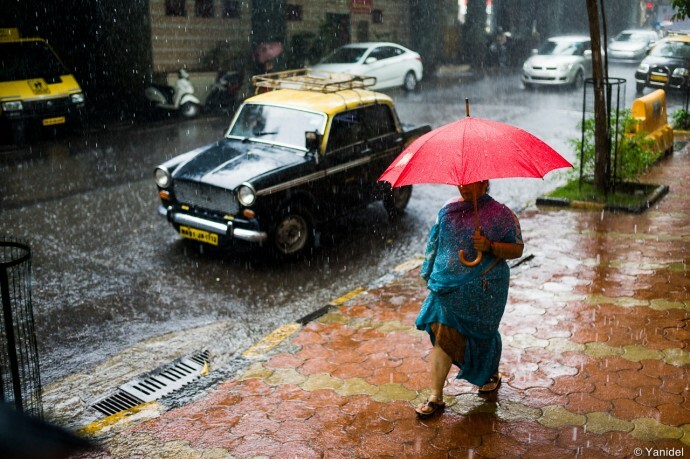 Where to shoot street photography in India ? 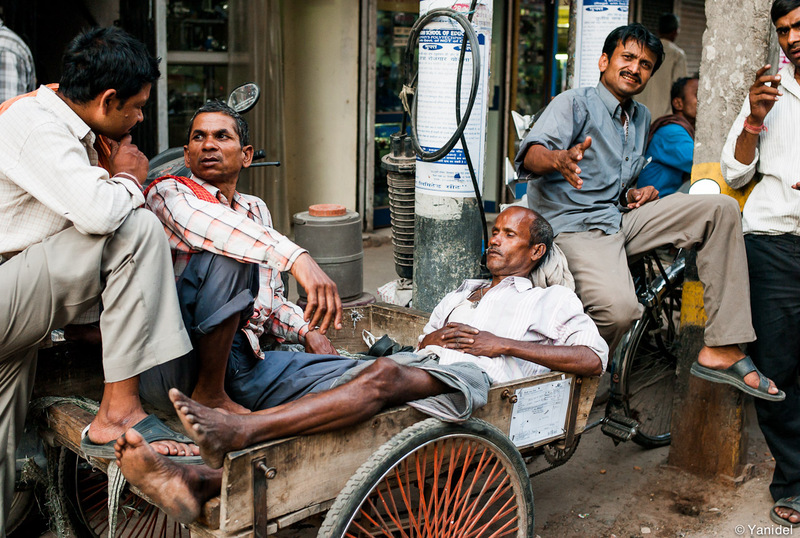 India is a street photographer's paradise. You'll simply find pictures opportunities at every street corner. Nevertheless, India is also a widespread country, and each state has its own set of very distinctive cultures and habits. So planning a trip to India ? Here is a listing of destinations grouped in four categories ; the metropolis, the Holy places, Rajasthan and the old colonies. It is obviously not an exhaustive listing and it is purely based on places we did visit. These are all locations that will easily allow you to combine street photography and visits to the main touristic attractions of India. The main cities of India are gigantic. Let's say it straight away, if you are claustrophobic, this is not the place to be. 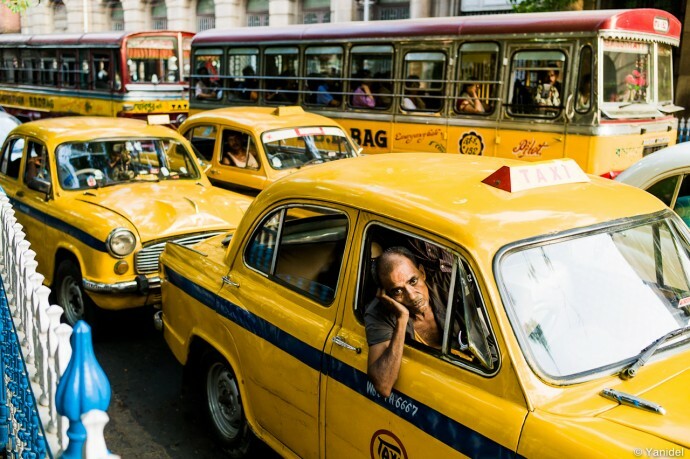 The metropolis of India are exhausting due to high heat, noise, traffic and mass population. Yet, they are second to none for street photography. Delhi : The main bazaars of Delhi are the modern version of Dante's Hell. Huge crowds, streets jammed by rickshaws, permanent honking, filthiness, and about any good on sale that you could think of. While you might leave half insane, you'll definitely come back with interesting pictures. Calcutta : The city has a bad reputation and probably was one of the worse place on earth to live in 30 years ago. Yet it has changed and we found it great to visit and shoot. Built by the British, it boasts large avenues, parks and an intense street life. Add to that the thousands of 1950's yellow cabs and you definitely have a great setting for street photography. Madras : Renamed Chennai after the Indian Independence, Madras is a large city that isn't all that interesting. 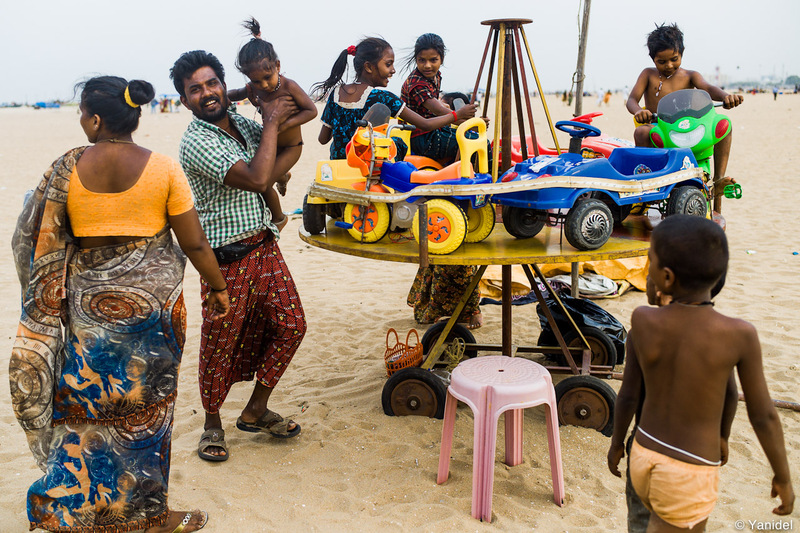 Yet, its kilometers long beach is simply an amazing location for street photography. Thousands converge there everyday to eat, play or relax in a flurry of colors. Bombay : Bombay was another pleasant surprise since it offers a large variety of settings. Be it the British Raj heritage downtown, the long marine drive, beaches, the busy bazaars or old fishermen villages, Bombay will keep you busy with a lot of different spots to shoot at. In the eyes of a Westerner, the Hindu religion with its mysticism and rituals is a visual bonanza. So imagine when all India converges to some of the Holy places, it cannot get any better in terms of pictures opportunities. The Golden temple of Amritsar : Located in Punjab, the land of the Sikhs, Amristar is not that interesting as a city. Yet its people are simply wonderful and Sikhs probably some of the most photogenic people. 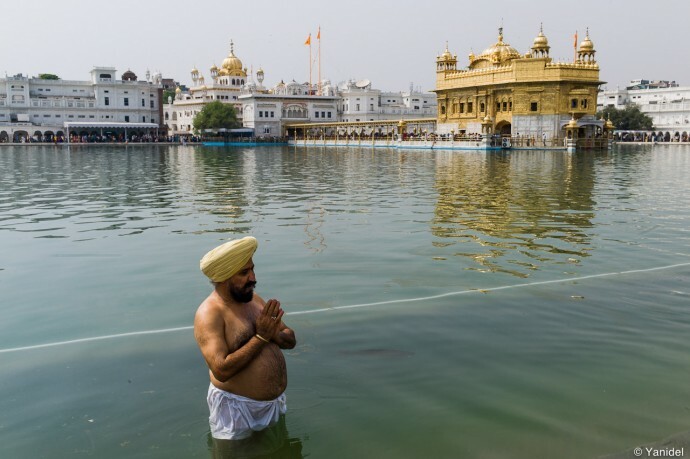 As for the Golden temple, it probably was my favorite location in India. Peace, music, hospitality and great scenes to shoot all around the Holy pond. Rishikesh / Haridwar : Located at the end of the Himalaya chains, at the place where the Ganges water finally flow into the plains, Rishikesh and Haridawar are part of the Seven Holy sites of India. 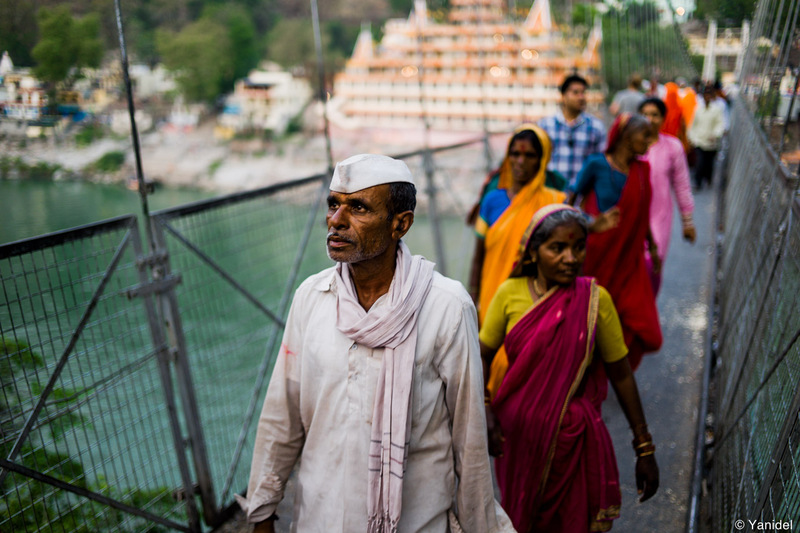 Two 6 foot wide bridges cross high over the Ganga river and are worth the trip by itself. You'll spend the rest of your time walking on the piers (ghats) among pilgrims and Sadus busy with their worship rituals. Benares (Varanasi) : Benares is probably the most famous Holy place in India and therefore one of the major touristic spot of India. 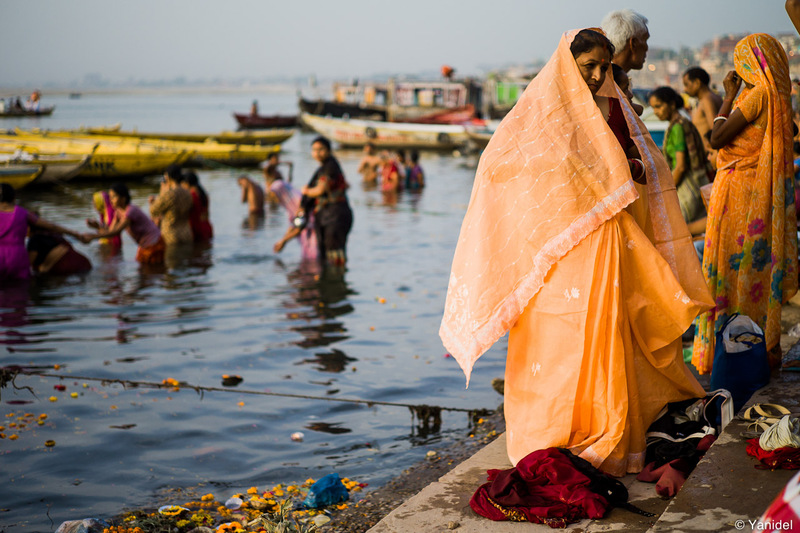 The sights and rituals ashore the Ganges are simply stunning and many of the most iconic images of India were taken here. Yet nowadays, you simply get harassed by vendors all over the city, making it one of our worse experience in India. Still do visit, just don't stay more than a couple of days. 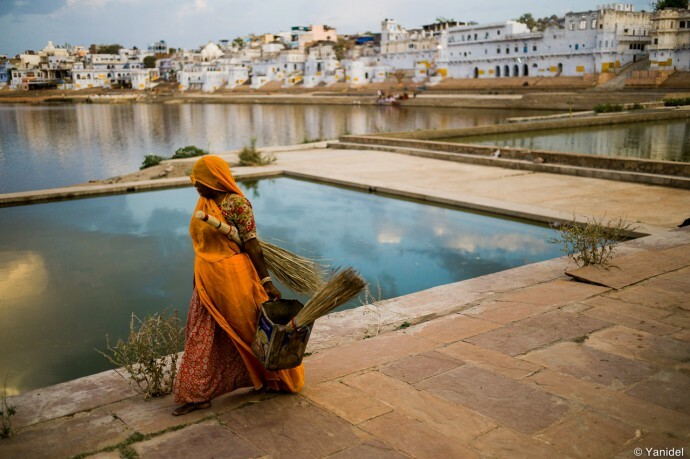 Pushkar : A tiny town in the middle of Rajasthan, the Holy lake of Pushkar is simply magical. Surrounded by Palaces and stairs, it is unluckily prohibited to take photographs around the lake. Still, you'll still be able to get some shots from up the stairs or by visiting very early in the morning. A two days visit to Pushkar is a must, it doesn't get any more mystical than this. The Land of Kings is a country in itself. Surrounded by desert, its fortresses, palaces and markets are a delight for the eyes. But most of all, the colors of Rajasthan is why you go there and you simply won't stop shooting at women in sarees. More than elsewhere in India, Rajasthan has kept its culture, making it the place not to miss in India. The classics : Jaiselmer, Jodhpur, Udaipur, Jaipur. All these cities showcase wonderful palaces, tiny streets, busy bazaars and imposing forts. They are also quite touristic so you'll have to get up early to get a glimpse of the real locals life. Street photography is great there but you'll have to get out a bit of the beaten path to find the authenticity of these cities. In Jodhpur, the blue city. The hidden gems; Bikaner and Bundi. In terms of street photography, these two cities were my favorites. Less concurred than the classics, life there seems to have been stuck in time. 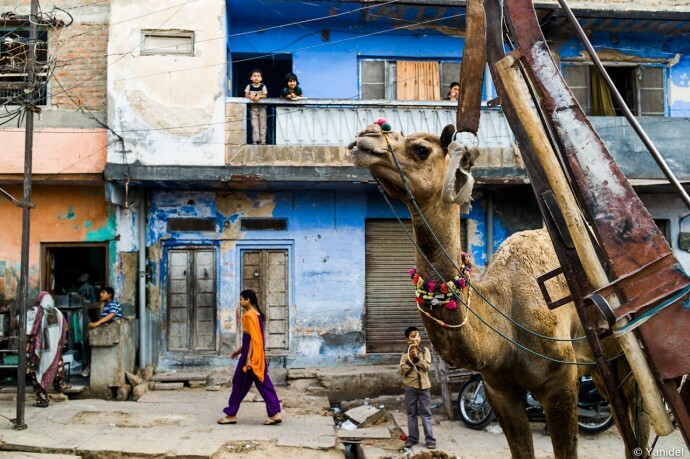 You'll find goats, camels, cows walking in the very downtown of the cities. Since few tourists visit, you'll also avoid all the stalking present in other Rajasthan cities. These cities were basically built by the Europeans about five centuries ago. 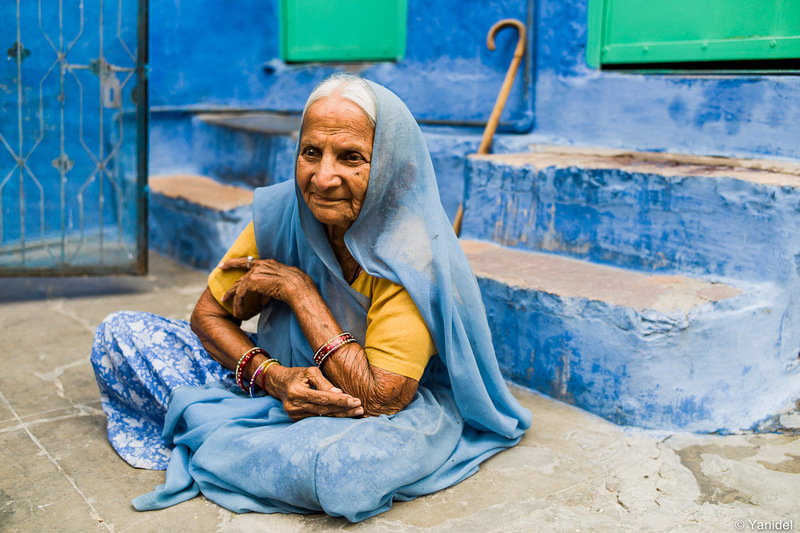 Turned over to India after Independence, they now showcase a great mix of Western heritage and Indian cultures. 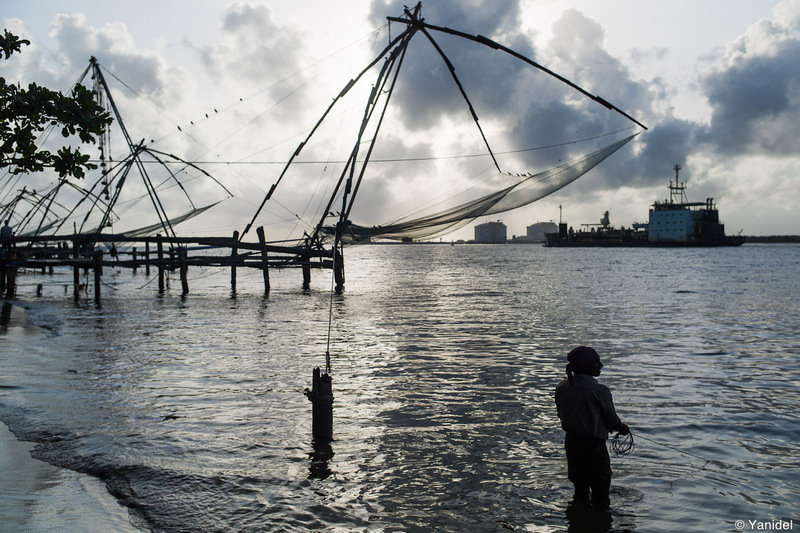 – Cochin : Cochin is one of the best place in India for street photography. You'll get the Dutch heritage part of town with the Chinese fishing nets. Yet you'll also be able to shoot in the modern downtown. The city is surrounded by water so you'll have plenty of opportunities to shoot popular fishermen neighbourhoods and visit the famous backwaters. 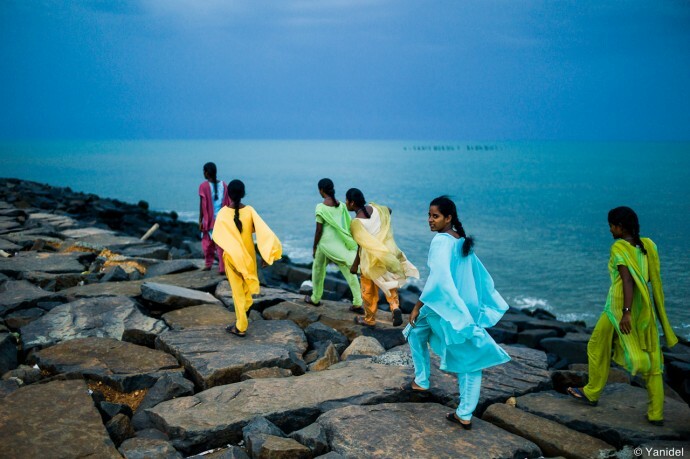 – Pondicherry : the former French capital of India, Pondicherry retains a lot of his colonial heritage. Its streets are not very busy but the bazaar and sea front promenade will provide plenty of photography opportunities. It is also the best place to take a rest while enjoying some French cuisine at its many restaurants. – Taj Mahal : Plan a one day visit, but sincerely, I wasn't that impressed and there are simply too many toursits in Agra. The city itself has no interest whatsoever. – Madurai : The main temple is marvelous, but this large city has absolutely nothing else to propose. Still, I enjoyed shooting in its streets full of friendly people. – Munnar : If you enjoy the sights of tea plantations, this is a great place to visit. The town itself looks more like a slump than a picturesque mountain village. If you'd like to propose other destinations in India that combine well street photography and tourism, please let us know in the comments section below. 2 years ago we were lucky enough to be in a crazy confluence of events and people in Kanyakumari. The solar eclipse was about to take place and Euro vistors were everywhere. The annual Pongol Festival was also happenign at once. It was a mad mix of people and great street shots. In the eveings people would gather at the southern most tip of India at the '3 oceans' to watch the sun set. ive loved looking through youre work, especially all the stuff in india.The calcutta traffic jam pictures is one of my favourties along with some of the punjab stuff.Heading back to bombay for the monsoons and wanted to post you some of my shots from Dhobi Ghat, Bombay. Thanks for sharing, too bad I did not have time to visit Dhobi ghats ! There are some great photographs here, Yanidel. I live in India (been here for two years now) and have spent that time travelling around taking street photographs, so I'm familiar with a lot of these places and you have captured them well. I think ultimately it doesn't matter where you go in India, there's a photo opportunity on every corner! I'm from India and more into street photography only. I would say India is a different genre of street photography where you don't need to get limited by the above said known places. I think the skill is in street photography is to capture the essence of the place, irrespective of the place. Please shoot me a note if anybody needs any tips in covering India. Nice post again though! I love what you shoot and try to learn from what I see and read here. Thanks for the precision, I meant after independance in the first sense, but you are completely right. Not sure how I missed this one. Loved your take on India and your points are fairly accurate. Having returned to India after a brief stint in London, I have been rediscovering India as much as I can. So far, its been Calcutta, Chennai and some other towns near these two cities. It has been quite a revelation and there seems to be a story hidden around every corner. And I do hope you had a decent walk through North Calcutta which could take you through a time warp of sorts.